On this garden paving project our clients had a steep, sloped garden. 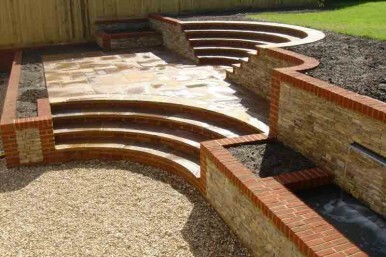 This was the second phase of a design and build project where the client had engaged us to completely change his rear garden. This particular project highlights the colours within Indian Sandstone paving. Have discussed all the requirements this work was undertaken knowing that a new house extension was planned and they wanted the garden all ready and finished before the house extension work went ahead. This was partly due to the amount of excavation as well as our combined ability to forward plan.